Finance ministers from the Group of Seven rich countries gathered Saturday to confront concerns about the dollar, in a forum whose role is under question as developing countries get more say. G-7 officials indicated their joint statement could be less detailed than communiques of the past, always intensely parsed for policy language that could move markets. Questions ahead of the meeting about whether a communique would even be issued suggests a changed role for the forum of industrialized democracies after the decision at the Group of 20 summit in Pittsburgh to make the G-20 the world's premier economic forum. The G-20 includes the growing economic powerhouses of China, Brazil and India. The G-7 countries are the United States, Japan, Germany, France, Britain, Canada and Italy. Canada _ next year's leader of the grouping _ has indicated that it will continue with the finance ministers meetings, while there is speculation that France, which is due to take over leadership of the G-7 and the G-20 at the same time in 2011, may ditch the smaller forum. There's even talk that a new Group of Four, which would comprise the U.S., Japan, China and a representative of the European Union, will look to co-exist alongside the G-20 in the near future. Britain's finance minister Alistair Darling sought to dampen talk that it would be a new important body. "We talk to lots of people but we don't put a G in front of it," Darling told a media briefing ahead of the meeting. The finance ministers, who will be joined by their central bankers, still have important issues to discuss as the world economy begins a slow recovery from the deepest recession since World War II. Chief among these is likely to be the dollar, which has been falling in foreign exchange markets in recent weeks and months. In recent days, it sank to an eight month low against the yen and the euro nearly hit a year-high against the dollar, prompting concerns that a dollar crisis could bring the world recovery to a grinding halt. Analysts will be looking to see whether the group makes a statement aimed at supporting the dollar. The U.S. currency won some respite Friday ahead of the meeting as higher than expected U.S. job losses for September stoked a flight toward safe haven assets _ the dollar usually garners support in such situations. The dollar closed the week just below 90 yen while the euro was a tad short of $1.46. A falling dollar hits exporting countries as they will find it more difficult to sell their products to the U.S. and raises the cost of commodities such as oil, which are priced in the U.S. currency _ potentially putting a brake on global growth, which the IMF earlier said was fragile. The Europeans appear to be expressing the most acute concerns about the situation in currency markets in the run-up to the meetings. European Central Bank president Jean-Claude Trichet warned Thursday that excessive volatility in exchange rates could damage economic and financial stability. Most analysts think that the root of much of the tension in the currency markets is the relationship between the dollar and the Chinese yuan. For many years the Chinese authorities have kept their currency artificially low against the dollar, partly as a means of boosting their exports to the United States. As a result, China has built up a massive trade surplus with the U.S. Leading officials at this week's annual meeting of the International Monetary Fund and the World Bank have argued that a failure to deal with these imbalances, particularly between the U.S. and China, represents one of the biggest risks to the global economic outlook and one of the reasons why the G-20 is now the forum of choice. 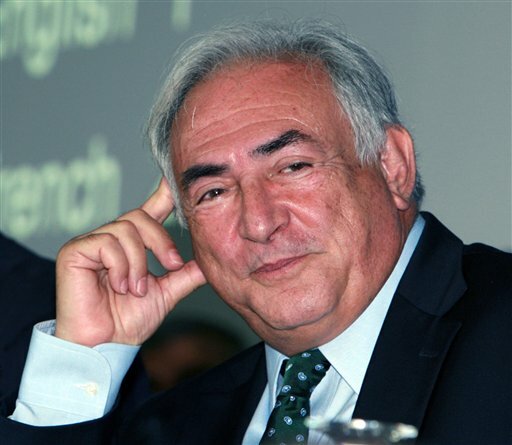 Dominique Strauss-Kahn, the IMF's managing director, even suggested that the world should pool its reserves to alleviate the need some countries feel to build up reserves to kee speculators at bay _ particularly governments in Asia in the wake of their financial crisis a decade ago. Robert Zoellick, the president of the World Bank and a former U.S. trade representative, has warned the U.S. authorities that the dollar's status as the world's leading reserve currency should not be taken for granted and that the euro and the yuan could win increasing acceptance in international currency markets. Jim O'Neill, chief economist at Goldman Sachs, sought to dampen any talk that the dollar is facing a crisis. In a roundtable discussion here, O'Neill said the dollar remained a crucial lynchpin in the world economy, illustrated by its steady performance Friday when it brushed off the downbeat U.S. jobs data. "When you get bad news, the dollar rises," he said.